Most dogs love a frolic in the snow, but there are precautions that should be taken to ensure the comfort and safety of your dog during the cold weather. 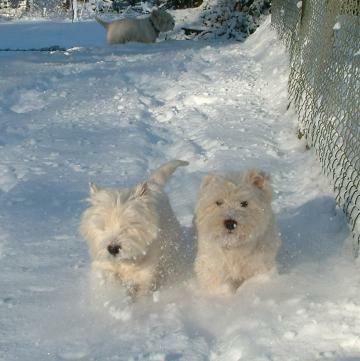 Dogs get very invigorated by cold weather and snow. They may ignore the pain of frostbite and the effects of beginning hypothermia if they are having fun. This happens more often when they are playing with other dogs or animals or their owners. Do keep a watchful eye on your dog. If you have a puppy including dogs that have not developed their adult coat they have on a “summer shirt” They have no protection from the cold. Use caution when taking puppies out in cold weather. If you have a dog that you leave outside all the time and is not treated as part of your family or is living outside because of behaviour problems – re-home him. It is cruel to leave a social pack animal all alone, especially in inclement conditions. Keep an eye on your dog when he is outside in cold weather. If you see him lift a paw off the ground get him back inside right away. Dogs can get clumps of snow and ice packed between their pads. Pads can become cracked and dry and toes can be frost bitten. Dogs who walk where salt and other chemicals have been used to de-ice the surface are at risk of getting cracked dry painful paws. Because his feet hurt he will lick them and ingest chemicals which can cause gastrointestinal irritation. Consider dog boots, or use a footbath when you bring him back indoors. Clip the long hair on the bottom of your dog’s feet and between the toes to prevent build-up of ice balls that can be painful and difficult to remove. Trim nails regularly. It’s difficult to maintain solid footing in icy conditions with long nails. Keep a careful eye in snow. Dogs should not be left out during a snowstorm because they frequently lose their scent in snow and ice and easily become lost. Arthritis gets more painful during cold and damp weather. Be careful to handle your dog gently and slowly if he has arthritis, and see your vet for pain management solutions. Since Christmas we have had two calls from distraught owners whose dogs have drowned in their garden pond, which it has never shown an interest in previously. 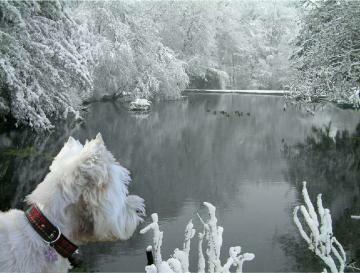 Frozen lakes and ponds pose a life threatening danger to your dog. They do not understand that the ice may be thin. Once they fall in it is almost impossible for them to get out. “Ice-skating” dogs are at risk of injuries such as torn cruciate ligaments and hip injuries. Don’t let your dog run and slide on the ice. Hypothermia is a lowering of the core body temperature well below the dog’s normal 101.5-102.5 normal rectal temperature. Substantial lowering of the temperature interferes with the metabolic functions of the body and affects the internal organs. A dog’s first reaction to the lowering of his temperature is to shiver. Shivering increases muscle activity, which in turn increases heat production. At the same time, his blood circulation shifts away from his legs and feet to his internal organs. Mild hypothermia causes an increase in blood pressure and heart rate, but if the time and severity of heat loss continues, heart rate and blood pressure decline and cardiac arrhythmias or cardiac arrest can occur. Severe hypothermia leads to respiratory depression, lethargy, lack of coordination, paralysis, and collapse. Treatment for hypothermia involves rapid warming of the body. In mild cases, heating pads, hot water bottles, or a warm water bath will do the trick, but severe cases require introducing warmed fluids internally via intravenous flow, dialysis, or enema. Vets may also use corticosteroids and monitor the dog for heart arrhythmias and pneumonia and check for frostbite. Prolonged exposure to the cold can also cause frostbite — the death of tissue in the extremities. If you think your dogs has frost bite warm the affected area SLOWLY and get him to a vet. Dog toes, tails, ear tips, and scrotum are the most common frostbite areas. Frostbitten tissue appears pale and is cold to the touch. It should be warmed slowly and given time to heal. It may turn red and swollen and be very painful as it heals. If it does not heal in three or four days, amputation of the dead tissue should be done to avoid gangrene in the area. Frostbite is frozen tissue, the tissue may die and fall off if not treated immediately. If your pet is a puppy or geriatric dog, don’t leave him outside without supervision, especially in snow. Dog feet can get very cold very quickly, especially on thin-coated dogs, and you may have to rescue a shivering pet that cannot walk across the snow. Invest in a warm coat for him, and dry it thoroughly after he has been rolling in the snow. Older dogs tend to potter rather than charge around maniacally, and like older people feel the cold more acutely. Their metabolic rate is lower than a younger dog, and they will need a little help to stay warm and mobile. We don’t normally believe in dressing up westies (or dogs in general), but this is when a warm dog coat comes into its own. You may find that your dog is reluctant to go outside to relieve itself in cold or wet weather (would you??) This is a common complaint, especially with small breeds, but it’s not hard to solve. Rather than wait for him to ask to go out, put him on a regular toileting schedule and take him outside at the appropriate times: first thing in the morning, last thing at night and after waking up or eating. If necessary, shovel snow from the area you want him to use. As always, use copious praise once ‘the deed is done’. For most dogs, even stubborn ones, this refresher course in housetraining 101% reminds them that they’re expected to be ladies and gentlemen whatever the weather. Take care with antifreeze, which is poisonous. Clean any spills and store household chemicals out of reach. The best bet is to carefully cap all containers of anti-freeze and keep them out of the reach of pets. If small amounts do drip when the anti-freeze is being added to the car radiator, clean them up and flush the area with water. Anti-freeze is extremely toxic to dogs and cats. unfortunately, anti-freeze is also sweet-tasting and pets will lap it up if they find even a few drops in the driveway or on the garage floor. One-half teaspoon of anti-freeze per pound of dog body weight is enough to cause the clinical signs of poisoning. The poison attacks the nervous system and the kidneys; the symptoms are depression, lack of coordination, vomiting and diarrhoea, increased thirst, and seizures. The toxin is rapidly absorbed; symptoms can begin within an hour of exposure. The toxic ingredient in most anti-freeze is ethylene glycol. If you suspect your dog has ingested anti-freeze, call your vet immediately. There is an antidote available, but time is of the essence; the poison can be fatal if the kidneys are damaged. Stray cats or your neighbour’s cat will look for warmer places when it gets cold. Car engines are a great place to get warm, and they offer protection from the wind. BANG ON THE HOOD OF YOUR CAR BEFORE YOUR START IT.